since I did a Works In Progress Post? And my Winter Citrus, waiting for some machine quilting! I will draw a winner soon. That for me is the horrible part of quilting - pinning, smoothing, repinning and praying that it is all smooth. Good luck, love your mystery HR project - especially the fish in a bag and that mermaid. I too have some basting to do. I'm all ready to baste my Jazz hands quilt ready for hand quilting, I love your version of it. I'm planning to do some more My Small World too. 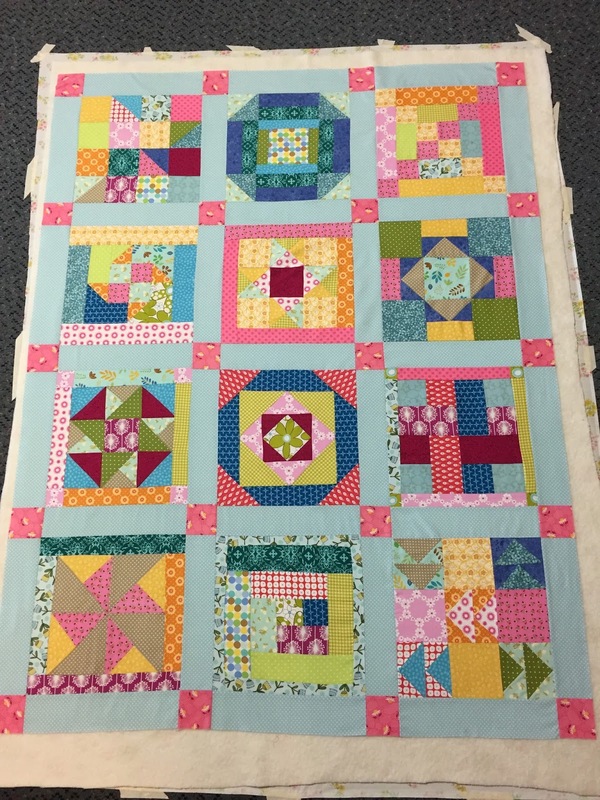 I love everything you're working on; I'm having a productive summer also--will be picking up four quilts from my long arm quilter and once those are bound, I finished 15 tops made possible by being retired and having no children/grandchildren to keep me company. I'm also working on EPP--I have some ready to be appliquéd to keep me busy for future road trips. I too am looking forward when your projects are finished, especially Melbourne Town. Beautiful projects - love your Melbourne Town! So many lovely things on the go and all so happy looking. Lots of beautiful projects happening with you. Excited to see how you'll finish Melbourne Town and Winter Citrus. I've just started a new pillow (even though I already have a list of WIPs I could be finishing ;o). Oooh--I was hoping to see that Melbourne Town was on the list to be batted and pinned (are those verbs?). You inspire me--I'll tuck it away for when I can get to those stages. These are all such beautiful projects. I'm just getting ready to BEGIN My Small World--mine is actually going to be "A Day at Disneyland." So many fun projects Susan. Especially love those the cute little hexies. Like you – a little bit of everything. I seem not to be doing much blog reading. You have so many fun things on the go. How to choose what to work on next?